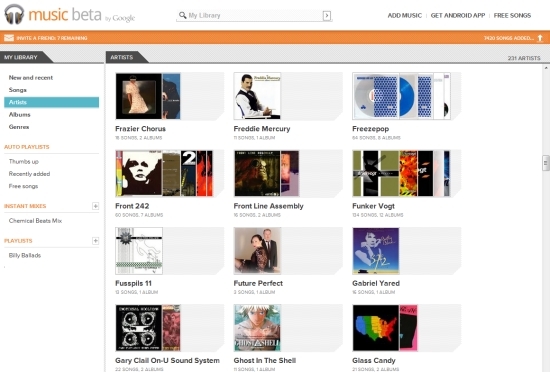 Google Music Beta is a cloud-based music locker service that lets you store up to 20,000 tracks for free. You can then play back your music either via a Flash-enabled webpage or an Android smartphone app. 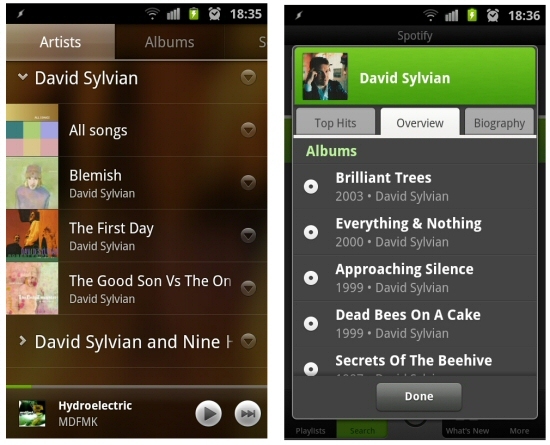 The Android app includes an offline option to store local copies of your songs. I’ve been using Google Music Beta for the past couple of weeks, putting it through its paces and comparing how it handles versus Spotify. Overall I’ve been impressed with its performance and ease-of-use. Read on for more. I have about 10,000 songs in my music library that aren’t available on Spotify. This includes some of the obvious no-shows (The Beatles, Metallica, Pink Floyd, Arcade File etc.) as well as around 700 albums from artists that only have one or two releases on Spotify (for example, English punk-rockers The Toy Dolls have only two of their dozen albums on Spotify). Google Music is not licensed by the record labels, so there’s no matching option: you need to upload your files to Google’s locker to be able to stream them. My 10,000 songs took about two weeks to upload (with my PC left on most nights) but this will of course vary depending on how many tracks you add and your bandwidth. You can specify which folders to monitor, as well as set how much of your upload bandwidth you want to dedicate to Google Music. 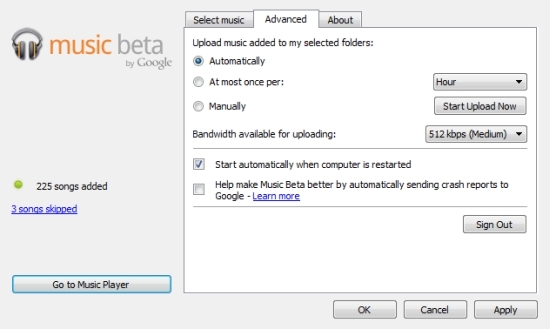 The Music Manager lets you select where to upload from and set various options. Uploaded music appears in “My Library” with areas to list by artist, album, song and genre. Your MP3’s ID3 tags are used for the metadata, but you can easily right-click and edit tracks (as well as upload album cover art). Some albums I ripped from CD and noticed they already had album art when viewed in Google Music, but most I had to add the art manually. The New and Recent area shows a coverart view of what you’ve uploaded or played recently, while a Recently Added area lists everything added in reverse order. You can like (“Thumb Up”) a song, and view an auto-generated playlist of these. You can create custom playlists which you can name but not add any coverart to. There’s also an “Instant Mix” feature which auto-generates a playlist of similar tracks based on a seed song. Artist, Album and Genre library views show up to five album covers per item, and the number of items shown on a row changes as you widen or shrink your browser (so no unnecessary scroll bars). Clicking through to an artist lists the albums in alphabetical order. There’s no way to sort based on e.g. year released or date added unfortunately, even though the metadata’s there to do that. There’s also no distinction between a full album or, say, a single or EP: they’re all listed alphabetically. Tracks have both Artist and Album Artist tags though, so Various Artist albums are handled well. The search bar is instant, so results are filtered as you type and match anywhere in the name. The instant results indicate whether it’s an album, artist or song which is handy too. Playback is surprisingly fast, with songs starting almost instantly after clicking them. Sound quality is as good as the uploaded version: there’s no downsampling, meaning that 320kbps songs stay at that high bitrate. Google Music also uploads FLAC files, although these are transcoded to 320kbps MP3s. The interface includes all the usual playback controls, including shuffle and repeat play. The gap between songs is also almost (but not quite) gapless for albums ripped with an indication of the gap length. 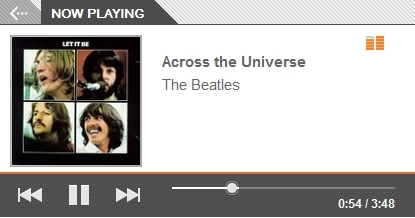 Google Music has pretty much all you’d need already, but there’s one essential add-on I highly recommend. Music Plus for Google Music is a Chrome extension that adds scrobbling, artist biographies, toast-style notifications, lyrics and hotkeys. It also adds a mini-player to the address bar, with playback controls and a full library search, so you can control your music no matter which tab you’re working in. Music Plus for Google Music mini player. The Google Music app for Android is a slick music player that’s fast and responsive, is easy to use and has almost all the features you’d expect. It does seem that your music is downsampled when streaming over 3G though, so you’re not getting the full high-quality as you do on the desktop. There are a few minor quirks and things I think are missing. I’ve already mentioned that you can’t sort albums or artists (e.g. by release date), and I’d like to be able to add coverart to the playlists I create. Albums with the same name seem to confuse Google Music (if you click on the album it shows it as one album with two track 1s, two track 2s etc.) and of course with the licensing deals, the initial upload time can seem like forever. The mobile app looks good but the downsampling is disappointing, and for those looking for true lossless streaming the transcoding of FLAC files to 320 MP3s is a let down. You might think this’d be a no-brainer: why use two different services when you can use one? Well, there’s more to it than that. It might come as a surprise to long-term readers of this blog, but I’ve decided to remove my local music from Spotify and use Google Music Beta instead. Here’s why. Google Music is a cloud-based locker service like Amazon Cloud Drive and Apple’s iCloud. Spotify, on the other hand, is a music streaming subscription service so not directly comparable. However, Spotify does include a local files option so that you can use it to play and sync music that’s not in the Spotify catalog. So on the face of it, Spotify is all you need. Why bother with cloud locker services at all, if Spotify can be used for everything? Local music doesn’t work across desktops. If you use Spotify on more than one desktop (for example at home and at work), your local music from home is not available at work (and vice versa). In other words, your local music stays local to the machine it came from, unless you subscribe to Spotify Mobile. Since Google Music stores all your files in the cloud, you can access that one library from anywhere and from as many PCs as you want. The Google Music interface is cleaner and easier to use. Spotify handles its own catalog reasonably well, but Local Files is a late arrival and a bit of a mess. You can’t easily view both Spotify and local music at the same time (it usually fails to include local files in artist view), and unless you make a playlist out of each local album the whole lot is grouped together in one giant list. I could just about put up with this on the desktop, but on mobile it’s practically unusable. All my music is in high-quality 320kbps. I always rip my CDs at 320kbps and only purchase MP3s at that bitrate too. 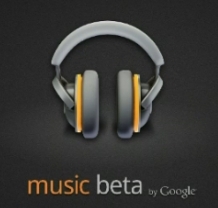 So when I listen to my tunes on Google Music, I know it’s all in high-quality. Not so with Spotify: everything’s capped at 160kbps on mobile, at there’s no guarantee that songs you listen to on the desktop are at 320kbps. Spotify claim that “not all tracks are currently available in high bitrate” but refuse to reveal the numbers (or add a bitrate indicator in the client). There’s anecdotal evidence to suggest that more popular albums are more likely to be in high-bitrate, but since I mostly listen to obscure synthpop and electro music that doesn’t really help me. Gaps between songs (for gapless playback) are shorter than on Spotify. I don’t think Google Music does any pre-fetching, but it does seem that for gapless albums (where I’ve enabled “detect gap” while ripping the CD), the gap is very short indeed and almost imperceptible. I can listen on the desktop at work (where Spotify is banned). This is probably the clincher for me. I’m not allowed to install non-work related apps on my work PC, and Spotify has been explicitly named as a banned app. That left me fiddling with my smartphone all day and the 160kbps capped Spotify Android app. Spotify on Android does the basics, but it’s many versions behind the iPhone version and trying to manage more than a few dozen playlists with it is frustrating to say the least. Google Music is web-based however, so not subject to the same restrictions. I can use Google Music on the desktop (taking advantage of all that widescreen real estate) and have guaranteed high-quality audio. I’m not suggesting a move from Spotify to Google Music Beta for all music, just for music that’s not on Spotify in the first place. Of course there’s a complication here in that content comes and goes on Spotify. For example, John Lennon was completely missing from Spotify for years. His entire catalog was finally added to much fanfare back in October 2010 only for it to all be quietly removed again a few months later. So keeping track of what’s on Spotify is an essential but annoying chore for any serious music fan. I’m currently using half my storage quota on Google Music Beta, so at least I have some spare space for whenever I discover another favorite has been pulled. Google Music isn’t the first music locker service, and without record label support and music matching it’s probably not be the best either. But it works well (considering the “beta” moniker is hard-coded in the name), and for me is a better proposition than things like, say, Audiogalaxy where I have to leave my PC on all the time to stream music from it. Playback performance is impressive: in over a week of using Google Music every day on the desktop, I’ve yet to notice a single stutter or drop in sound.